Have you ever imagined what it must feel like to be a star college football player? Think about being a Heisman-winning quarterback and leading your team to the first ever College Football Playoff, hence Marcus Mariota. Or imagine running the ball like Melvin Gordon and being named the Big Ten player of the year. While it must feel great to have the spotlight, not every player shares such fame and fortune. Some players endure an elongated journey filled with blood, sweat and tears. For Jason Sloan, his journey has just begun. Sloan started playing organized football in high school. Long before he laced up his first pair of cleats, he suffered a gruesome injury when he accidentally stabbed his right eye with a screwdriver. The scar on his right eyeball is a constant reminder of that horrific accident, but he never let that incident hold him back, becoming an important player for McKay High School in Salem, Oregon. The 6-foot-3 lineman was one of the biggest players on the Royal Scots football team, but many said he was “too small” for the collegiate level. Sloan never paid attention to the criticism. His goal was always to prove people wrong. The 220-pound defensive end has been a member of the Oregon Ducks football team the past two seasons. Sloan has a unique role on the team. He doesn’t receive a lot of playing time, and he doesn’t travel with the team, either. 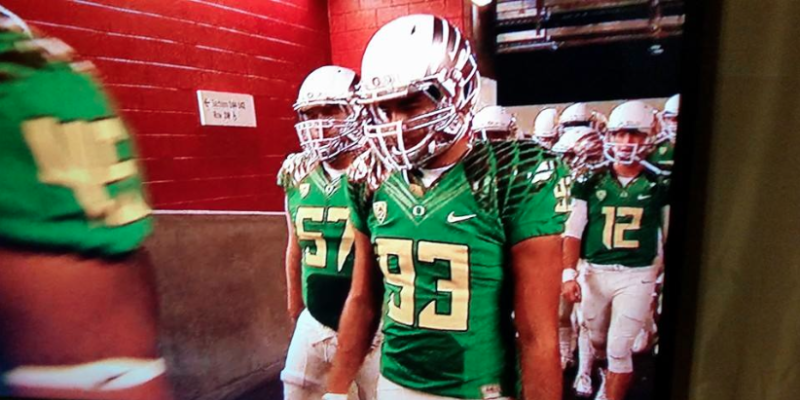 He makes his mark in practice as a member of the Ducks’ defensive scout team. Jason Sloan watches his fellow teammates from the sidelines. A scout team is composed of a group of players that practice against the rotation players during the week. Some college programs carry up to 40 scouts. Not only does the scout team participate in every practice drill and workout; the group is also responsible for learning and mimicking the opposing teams’ defenses and offenses. 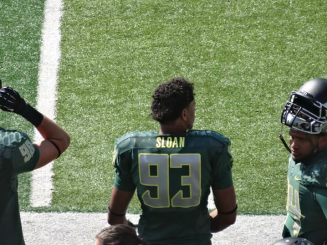 Since Sloan is part of the defensive scout team, he has to learn his own defensive playbook, and he also has to memorize the defense of every other school in the Pac-12 and any potential non-conference opponent, as well. “What we do is watch film on the opposing team and we mimic the opposing team’s defense, and we play against the starters (in practice),” Sloan says. The scout team’s main objective is to give the rotation players a taste of what they will see come game day. Ikaika Johnson graduated from the University of Oregon last June and immediately joined the football team as a defensive intern. He works specifically with the scout team. One of Johnson’s most important duties is to provide video footage for the scouts, including footage of the Ducks’ practices. He also has to create a video packet of the upcoming opponent. “When we’re preparing for an opponent, it’s important for us to practice against what could be the opponent. For them [the scout team] to give us the look of our upcoming opponent is huge for our preparation,” he says. Jason Sloan after the Ducks’ Rose Bowl victory over Florida State.